Simply click on one of the pictures below to order one of Sara's books. Feeling stressed about everything in your life? Learn how to conquer your anxiety today . . .
You didn't invite him to your party. He came uninvited and unannounced. To make matters worse, he's taken a permanent chair in your heart. Who is he? Find out how to show Anxiety the door in my newly revised book. The PCA bookstore also includes a link for a free Leader's guide and a sample of the book. Click here to visit the PCA bookstore link. Everyone needs an escape now and then. Escape NOW with . . .
somewhere inside a convoluted corridor of the mind? gambler. On other days, it feels like the gambler’s fingers are closing in for the kill. Escape Back to the 1950’s with . . .
A small Alabama town in the mid-50's. A lazy summer afternoon. No concerns for Fannie Lea except her dreadful name. No concerns, that is, until she and her brother trespass on Boyd's property. Then, it's a grip around the waist, a knife to her throat and Boyd's breath, a smell like spoiled cabbage laced with tobacco and licorice. Soon Flea (short for Fannie Lea) discovers secrets regarding other Sugar Hill residents. She learns the mystery behind Boyd's locked upstairs room and, eventually, places herself in danger to save a soul more helpless than she. Written in the style of To Kill a Mockingbird, the early 50's village of Chantilly, Alabama may appear peaceful but hidden beneath the surface is someone trapped by conflict, insecurity and longing, someone not too different from you or me. 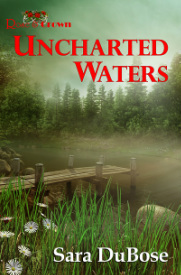 Where Love Grows opens with five words: “Child Drowns at Church Picnic.” As eight-year-old Mary Lynn Mitchell sinks deeper and deeper into Blue Lake, these words surface in her head. About to succumb to certain death, she imagines her new friend, Joel D. Lanier, writing this headline for her obituary. Joel, who has recently arrived from Charleston, works for the local newspaper. First assignment: obituaries. But this cub reporter rescues Mary Lynn, beginning a lifetime friendship and offering more than a few rewards and surprises. Rifle shots echo through time for Mary Lynn Mitchell, a little girl from a small Alabama town called Chantilly. Where Memories Linger completes a trilogy following Where Hearts Live and Where Love Grows.